The E2W Front Office Team are excited about our next meeting. 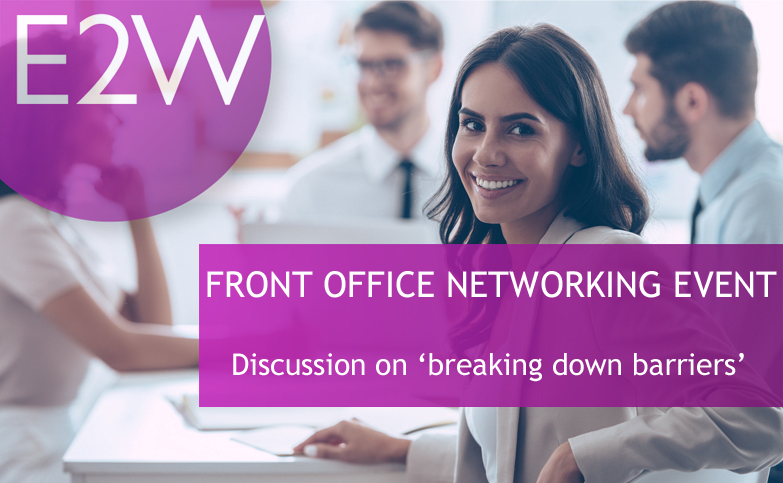 In addition to networking with other women working in the front office, we will also discuss the barriers to progression, how to break down the barriers, both perceived and real, and how to fulfil our potential. We plan to continue the buzz that was created in our last meeting by encouraging participation and support to others. This follows on from our last meeting where the attendees were energised at the thought of starting a new network and easily saw the benefits of connecting with women in a similar position outside of their own organisations. There was encouraging discussion about women taking the initiative to help their own careers and yet, willing to support everyone else too. Camilla McKane, Executive Director, Global Liquidity at JP Morgan, is kindly hosting this meeting on Wednesday 31st January, registration at 5.15pm, meeting starts at 5.30 pm – 6.30 pm, followed by drinks. The event will take place at JP Morgan Asset Management, 60 Victoria Embankment, London, EC4Y 0JP ( please use the entrance on John Carpenter Street. ).